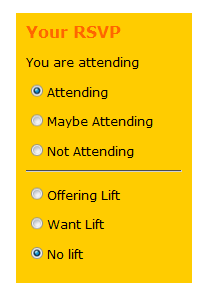 It’s now dramatically easier to show whether you are attending a Flock Together event or not, by clicking in the ‘Are you going?’ box at the top right of every meeting page. By using the kind of Web 2.0 technology used on sites like Flickr, the page will automatically update without needing to reload. Have a go by registering on the party conference page at http://www.flocktogether.org.uk/showMeetingPage.php?Meeting=2818. You need to be logged to get the full benefit. For those interested in such matters, it uses the prototype Ajax library to update the page without reloading.